It wasn't too long ago that Downtown Phoenix had only four tall buildings and little of interest to explore. You might even have seen tumbleweeds blowing through empty, dark, and dull streets! In the past two decades, however, Downtown Phoenix has emerged and continues to evolve as an exciting, and walkable, place to be. If you find yourself in Downtown Phoenix for a conference or are visiting for a business meeting, you might have a couple of hours to get outside, learn about the history of the area, see some unique downtown Phoenix attractions, and experience the vibe of the downtown core. You could certainly visit any or all of the following spots on your own, but you might not get as much background or detail as you would with a guided tour. The Phoenix Rising Tour Company offers walking tours, and the sights mentioned below are part of their Downtown Phoenix History & Highlights Walking Tour. The tours are focused primarily on art and history, describing the three phases of development of Downtown Phoenix: pre-territorial, post-territorial, and the current revitalization of the Phoenix core. Add to the art and history a sprinkling of thought-provoking facts and trivia, and you have a quick-paced hour-and-a-half overview of the growth of downtown in the nation's sixth largest city. In addition to the walking tour, the company also offers a Downtown Phoenix History & Culture Trolley Tour (recommended for summer months when it's too hot to walk) and a Downtown Phoenix Art & Mural Bike Tour. Bring your comfortable walking shoes and your camera! Public art is flourishing in many parts of the Valley of the Sun, and Downtown Phoenix is definitely a part of the excitement. Locals might not even know about the Alley of the Arts, the transformation of an alley dedicated to trash bins into a public space adorned with bright and meaningful murals painted by local artists. If you aren't careful, you might walk right past it! No question that this is one of the premier convention centers in the U.S. Even if you aren't attending a conference here, you might want to pop in and look at some of the art installations, as well as the pictorial depiction of the history of Phoenix. Back outside, look up, and you'll see a round structure atop the Hyatt Regency Phoenix. That's Compass Grill, the only revolving restaurant in Arizona. You might shudder at the thought of meeting up with a scorpion on your walking tour, but at the corner of 5th Street and Washington, outside the Phoenix Convention Center, you'll find a friendly one, along with a few other Social Invertebrates. The 19th century lives on in Downtown Phoenix, where you can see restored versions of original residences — built before air conditioning! The Rosson House Museum offers docent-led tours that last about an hour. There is a covered, outdoor pavilion, where special events take place. You can also arrange to have your wedding here. Two nationally acclaimed restaurants are located in Heritage Square: Pizzeria Bianco and Nobuo At Teeter House. The Arizona Science Center just steps away and is an entertaining and educational stop for both adults and children after your walking tour. "St. Mary’s Basilica, named The Church of the Immaculate Conception of the Blessed Virgin is the oldest Catholic parish in Phoenix and was the only Catholic parish in Phoenix until 1924....St. Mary’s became the 32nd basilica in the United States." If the church is open to the public while you are on your walk, step inside and take a look at the stunning stained glass windows, and see the plaque that commemorates where Pope John Paul II knelt in prayer during visits in 1987. If you'd like to spend more time here, for a small fee you may purchase a pamphlet for a self-guided tour. St Mary's Basilica is listed in the National Register of Historic Places and has been designated as a Phoenix Point of Pride. 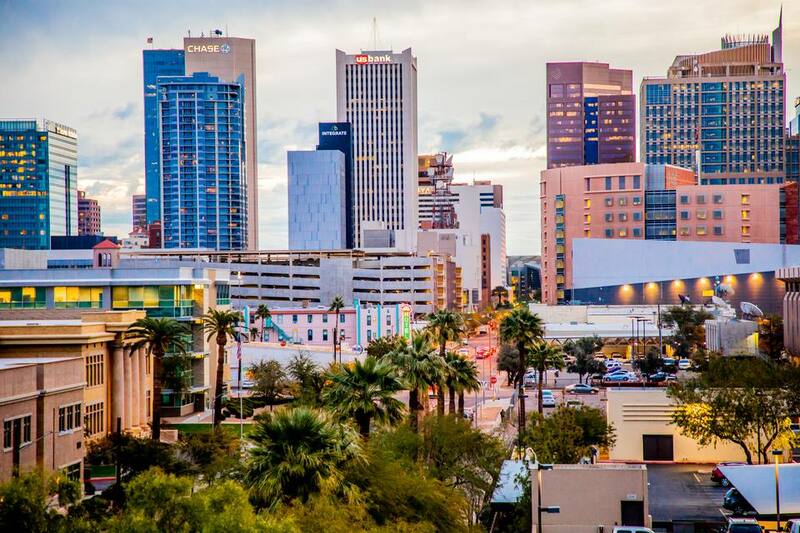 Both major Arizona state universities, Arizona State University (main campus in Tempe) and University of Arizona (main campus in Tucson) have satellite facilities in and around Downtown Phoenix. The Mercado is located just north of Heritage Square. It was originally built as a retail/commercial development and was subsequently taken over by ASU. The College of Nursing is located here. Other Downtown Phoenix ASU facilities include the Walter Cronkite School of Journalism and the Sandra Day O'Connor College of Law. The U of A is newer to the downtown Phoenix area and is where the University of Arizona College of Medicine, College of Pharmacy and other health-related fields of study are conducted. Valley Metro operates the light rail system in Phoenix, Tempe, and Mesa. At each station, art has been incorporated to beautify the stations and make transportation more enjoyable for both visitors and residents. In Downtown Phoenix, at the Jefferson Street/First Avenue, station you'll see a dedication to Sandra Day O'Connor, the first woman Supreme Court Justice (and Phoenix resident), as part of the Downtown Justice artwork created by Tucson artist Stephen Farley. At the 3rd St./Washington light rail station, take note of the fact that this station has solar panels cooling the station during the summer, and displays of more than 50 art pieces dedicated to Arizona's official state tie. The 26 Blocks art project is on display for hotel guests and the general public in the Renaissance Phoenix Downtown Hotel's lower lobby until 2018. 26 photographers, 26 writers, and one sculptor collaborated on a celebration of Downtown Phoenix by focusing on the past, present, or imagined future of 26 randomly selected city blocks. Right in the downtown core, you'll find one of Arizona's most noted purportedly haunted places. This hotel has been open since 1928, and it is a boutique, one-of-kind property. If you don't mind small rooms and you love vintage, this might be the hotel for you! Even if you don't stay here, you can visit the lobby and get a feel for what Downtown Phoenix was like nearly a century ago. In the fall there are ghost tours conducted here. Is it really haunted? That's for you to decide. Civic Space Park is a green area in Downtown Phoenix, a respite from all the high-rise condos, large commercial buildings, sports venues, theaters, and parking lots. It is a public park operated by the City of Phoenix and is well-utilized by the college students who live and go to school in the area. There are year-round musical events, outdoor movies, food trucks, and other activities for casual gatherings. During the summer there is a free splash pad for the kids. There are plenty of shady areas, access to public transportation, and an oft-photographed sculpture created by artist Janet Echelman; it is illuminated at night, with colors changing with the seasons. The installation of the sculpture was not without controversy! Originally called America West Arena and then US Airways Center, it is currently the home of the Phoenix Suns, Phoenix Mercury, and Arizona Rattlers. Big name concerts and shows are held here at the Talking Stick Resort. Chase Field is the home of the 2001 World Champion Arizona, the Diamondbacks, you can take a guided tour of the ballpark year-round, but you must make reservations. There is also a restaurant in right field at Chase Field, Friday's Front Row (part of the TGI Friday's family), that is open to the public 363 days a year with a full bar & restaurant menu. On days when there is no game or event, it is open to the public, and you can see any activity (groundskeepers?) that is taking place on the field. The Phoenix Symphony, Arizona Opera, and Ballet Arizona call this venue home. It is operated by the City of Phoenix. CityScape is a multi-use development with retail, restaurants, entertainment, and hotel. Outdoor events often take place here in the grassy area (Patriots Park), including a very popular ice skating rink during the winter holidays. In the summer, kids take advantage of the splash pad.